Original article: Child safety is a very serious matter while driving a car. 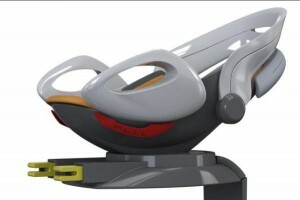 Taking this subject into consideration, a British inventor has created a baby car seat with active airshield technology that cocoons the child during a car accident. 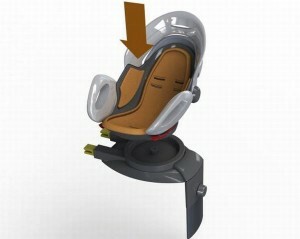 Built-in fold-over airbags open up on impact and wrap the infant in bubble without chocking off the air supply. 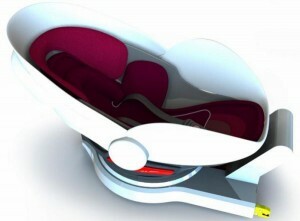 The cocoon, unlike a conventional car airbag, stays swollen and stiff enough to protect the child from falling objects. Also, the integrated trigger system automatically dials the emergency number 911. Dubbed Carkoon, the most innovative and safest baby seat is a brainchild of Julian Preston-Powers and is likely to hit the shelves next year. Julian uses Kevlar material to make it fireproof. The quick releasing mechanism gives parents and emergency services a freedom to remove it quickly with ease after a crash. The equipment, which is vital for the survival of a baby during a car crash, will be available for purchase at a cool £500 (US$ 795).